An Unlikely Valentine to Public Art! One of my students, Maya, is working on a portfolio for college art school admission. Her love of the graphic arts has sparked an interest in graffiti. This has inspired a series of work on street art. Her most recent piece is a tongue in cheek Valentine. 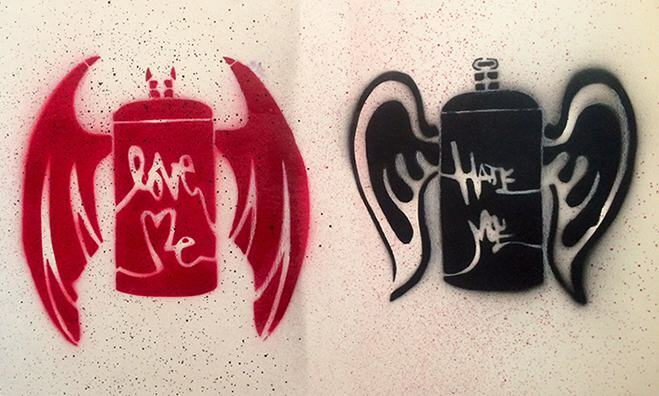 The image: angel and devil spray-paint cans with the phrase stenciled across Love me/Hate me. The idea behind the work is the ethical dilemma many street artists face: where to make the art? Graffiti by definition is illicit and the public often fears if a wall or store face is donated to this art form it will inspire others to leave their mark. Let us all hope so! Being inspired by graffiti surely doesn’t mean a young artist is going to hop curfew and start tagging windows at Walmart. A better train of thought would be supporting public art and getting behind the movement to make our public places more intrinsically interesting. Commissioning graffiti artists, muralists, mosaic and sculpture artists is a good thing for our community. Discovering art in unlikely places and spaces gives us the opportunity to stop in our tracks and LOOK. Love it or hate it, when we intersect art, for a second or two (or gasp, maybe longer) we are invited to think. If there is a well-placed bench, a piece of public art might just inspire us to put down our phones and embrace the day in an entirely new way. I admire Maya’s interests in this art form and encourage it. Her Love me/Hate me spray cans are more than a call to think about graffiti, they illustrate things are never as simple they seem….note, the angel can is the “Hate me” and the Devil can is the “Love me”. Maya is wise for her years, and as all of us proponents of public art know: The devil is ALWAYS in the details. Tell your city or town managers that you support public art! And Maya, Good luck getting into the school of your dreams! WE all hope you make your mark.